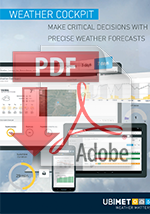 This professional weather application helps weather-dependent industries to increase their safety and efficiency. With the Weather Cockpit® companies receive relevant weather information to aid with the optimization of resource planning and deployment. This, in turn, assist with smooth operations and ensures the safety of employees’. Are your day-to-day processes and activities impacted by weather events (slippery conditions, sand/snow drifts, storms, freezing rain, etc.)? Would you like to achieve 24/7 operational optimization at multiple sites? Are safety aspects in the event of lightning strike an important topic for you? Do you consider efficiency and cost reduction in the coordination of winter services an essential issue? Do you operate infrastructure (energy grids, railway lines, road networks, etc.) that requires specific maintenance in the event of weather events (such as slippery conditions, sand/snow drifts, storms, freezing rain, etc.)? 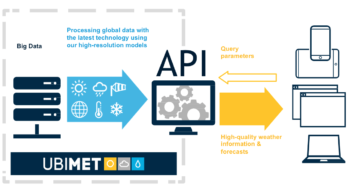 If the answer is yes to any of the above, the user-friendly UBIMET Weather Cockpit® is the innovative application that is able to reflect individual processes, such as resource planning and alerts, within your organization and at the same time supply best practice processes for various industry sectors. The Weather Cockpit® is an intuitive online portal that supplies location-specific weather data and forecasts as well as severe weather information. Not only is this professional application clearly structured and easy to use, it is also tailored to your individual requirements. The tool visualizes weather events for routes, locations and regions on high-precision maps and offers comprehensive weather information at a glance. Is it possible to operate a crane, or is the wind already too strong? Can a golf tournament be played, or does a severe thunderstorm pose too high a risk? Do I have to deploy winter service personnel if there is heavy snowfall tonight? In addition to live weather data such as the precipitation radar or lightning detection, the application shows forecasts for temperature, rain, wind and many other parameters at an hourly resolution and with pinpoint precision for the desired location(s) and region(s). For weather-dependent activities, you can set your own limit values and determine the optimal time window for critical work by means of the traffic-light system. Severe weather alerts, among others via SMS, provide employees with timely information regarding any precautionary measures to be carried out. The Weather Cockpit® is a professional weather application that can be used by companies to improve safety and increase efficiency. Do you have your own systems?